Focusing on the breath is one of the most common and fundamental techniques for accessing the meditative state. Breath is a deep rhythm of the body that connects us intimately with the world around us. Below you will find five different breathing exercises. It is important to be aware of your breathing, and be able to switch in to abdominal breathing for all of them. Become comfortable with “Basic Natural Breathing” first before moving onto the other more advanced breathing exercises. Please remember that even though the exercises can be learned very quickly, it may take months of practice to see the effects of practicing them. Make use of this simple breathing exercise before grounding and centering, meditation, more advanced breathing exercises (below) or other activities where you need to feel relaxed. Sit, stand or lie comfortably with your back straight. Slouching inhibits your ability to breathe. Name anything that is worrying you. Allow these thoughts to remain for only a few seconds, then let them go. Relax your arms and shoulders and place one hand on your belly. Slowly exhale through your nose, releasing all the air without straining. Take a deep inhale, filling first your abdomen, then your chest. Continue to exhale and inhale in this way, remaining conscious of each breath until your breathing is steady and feels natural. Whenever you find your attention wandering away from your breath, gently pull it back to the rising and falling of the breath. Gradually, you will become less aware of your breathing and you will become more centered inward. Use this breathing technique when you feel tension in your muscles. Follow the steps for Basic Natural Breathing (above) starting in a seated position. Search your body for the source of your tension. Consciously tell the tense muscles to relax. Inhale deeply through your nose, pause, then exhale, count “one”. Repeat, counting your exhalations to five. Begin again, counting exhalations one to five. Continue this exercise 5-10 minutes. This breathing exercise can be used to cleanse your respiratory system. Additionally use it as part of a pre-ritual cleansing. Follow the steps for Basic Natural Breathing (above). Inhale a complete, natural breath through your nose. Make a small opening between your lips, and forcefully exhale a short burst of air through your mouth. Repeat until you have emptied your lungs via these short, strong puffs. With each puff out, visualize any negativity leaving your body. Inhale, visualizing pure, cleansing air entering your body, filling you with purity. If you are in need of an energy boost this breathing exercise will re-energize you. Follow the steps for Basic Natural Breathing (above) starting in a comfortable standing position. Use your breath to help you move through the following movements. Stretch your arms above you head (inhale), then release them by your side (exhale). Continue stretching up several times, reaching higher each time. Spin your arms backward (inhaling on the way up), all the way around (exhaling on the way down). Switch directions, spinning them forward (inhale arms up, exhale arms down). 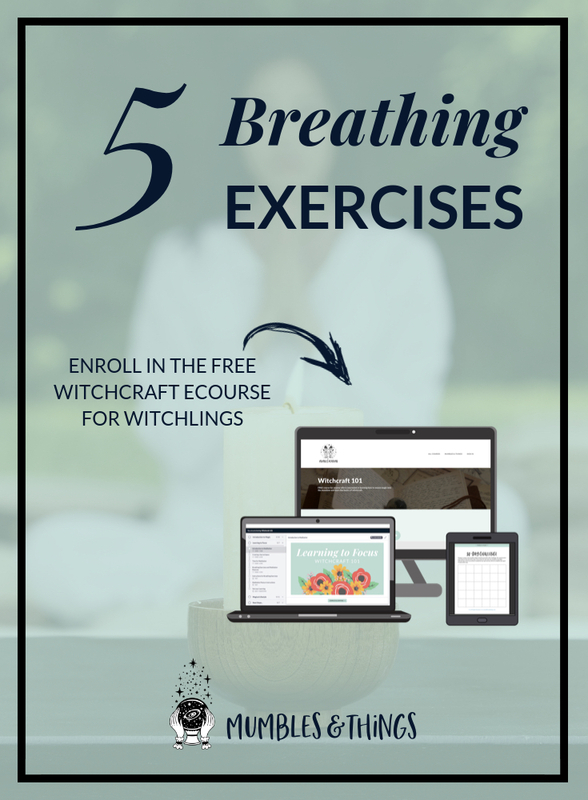 This breathing exercise is useful to calm yourself before healing practices like chakra work and crafting healing potions, teas and tinctures. Starting in a comfortable lying position, follow the steps for Basic Natural Breathing (above) for a few minutes. Place your dominant hand on the part of the body that is in need of attention. Place your other hand on your belly. Visualize cleansing, purifying, disinfecting energy flowing into you with each inhalation. Imagine this energy flowing into the affected area, washing through it, driving out the pain or infection. Continue this exercise until you are ready to stop. Place both arms at your sides, palms turned downward and let the excess energy in you hands flow back into the surface/ground beneath you. This exercise may be repeated as needed. 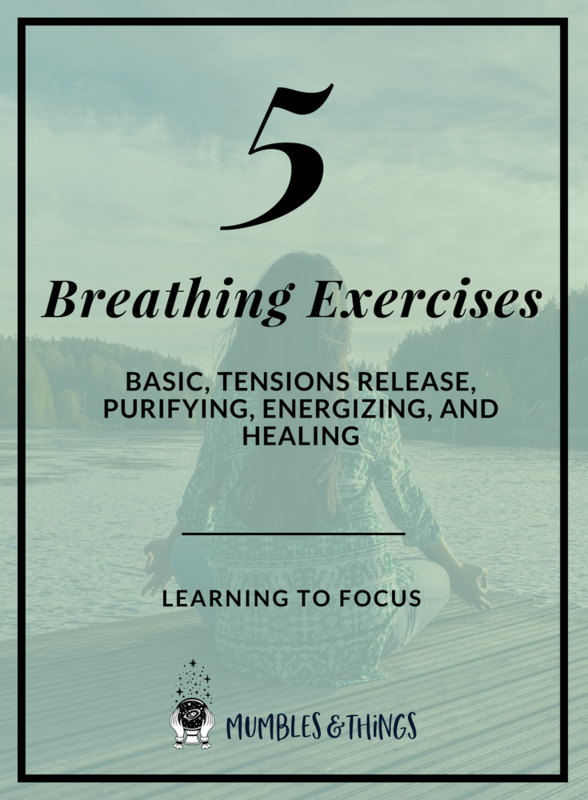 As you can see, there are many breathing exercises, even more than those listed in this post, that you can utilize based on what your intention is. Spend some time with each one and make notes on how they effect you. Continue you journey and share your experiences on the Mumbles and Things Facebook page. What breathing techniques have you tried? Do you have anything to add to this post? Let me know in the comments below.